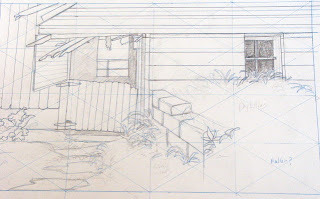 Here is a start to another drawing. This is based on photographs taken four years ago in Trempealeau county. This particular site with its horses and worn out barn has already been the inspiration for several drawings. Some places have so many possibilities for pictures. Currently I am reading Diary of an Art Dealer by Rene Gimpel. It is a fascinating look at the arts scene in the early 20th century.